The Meritage is a Picnic Time patented original design. It's constructed of 600D polyester in pine green and features deluxe insulated wine and cheese service for two and storage for two bottles of wine or spirits. 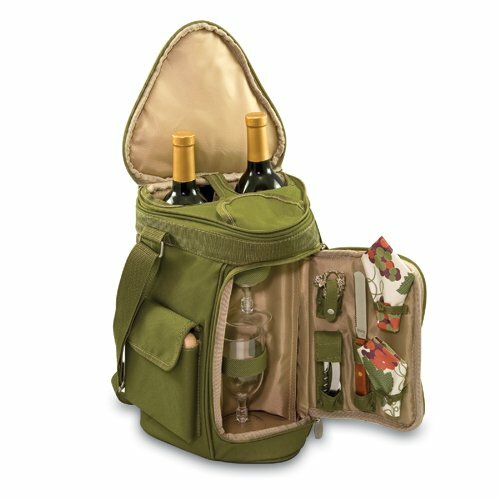 The insulated wine glass section converts to a third bottle compartment to give you more options. Any of the wine compartments can also be used to store snacks such as cheese, fruit and crackers. The Meritage has a padded, adjustable shoulder strap with non-slip underside and a padded handle for comfort and easy carrying. It comes complete with: 2 wine glasses (8 oz., acrylic), 1 hardwood cutting board (6 x 6in), 1 stainless steel cheese knife with wooden handle, 1 stainless steel waiter-style corkscrew, 1 nickel-plated bottle stopper, and 2 napkins (100% cotton, 14 x 14in, Nouveau Grapes design). When wine and cheese is all you fancy, the Meritage is the ideal way to ensure you have all you need in one tote.